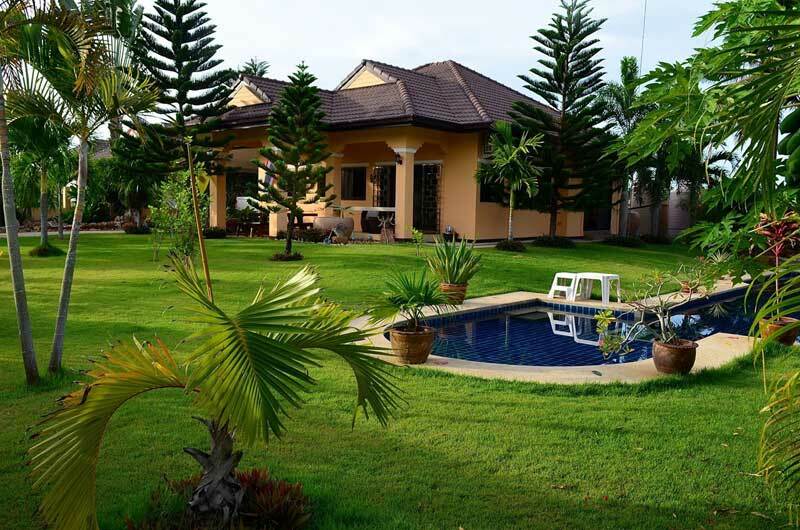 So you are looking for a beautiful place to retire in Thailand, a very special vacation home, or simply a great investment property. Well then your wishes have come true with this 3 bedroom Tropical Pool Villa for sale in Pranburi. Thailand is all about quality outdoor living and this tropical pool villa for sale in Pranburi is designed for the best outdoor living you could ever want. Beautiful landscaping all around the home and a large covered BBQ area overlooking the custom built salt water pool and gorgeous mountain views all around. 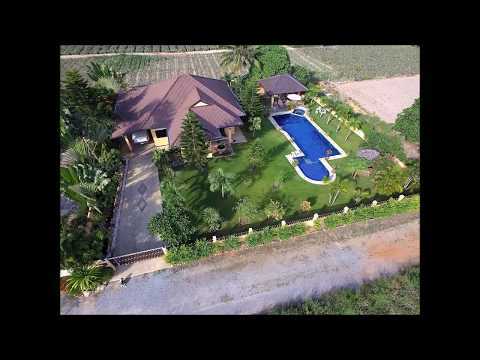 The 3 bedroom pool villa for sale near Hua Hin is one of the few stand alone properties that is not part of the so called “development” (gated ghetto communities). Private large 1 rai (1600 sq. meters) of land and “No Fees”. This beautifully landscaped large land gives you room to breathe, be creative and enjoy the quality lifestyle that you always have wanted. Sooner than you think you will become friends with the Thai neighbors as well as British, French, Dutch, and Swiss around the area. And of course you have room for your four legged friends or tropical birds on your around the lush gardens of the land. 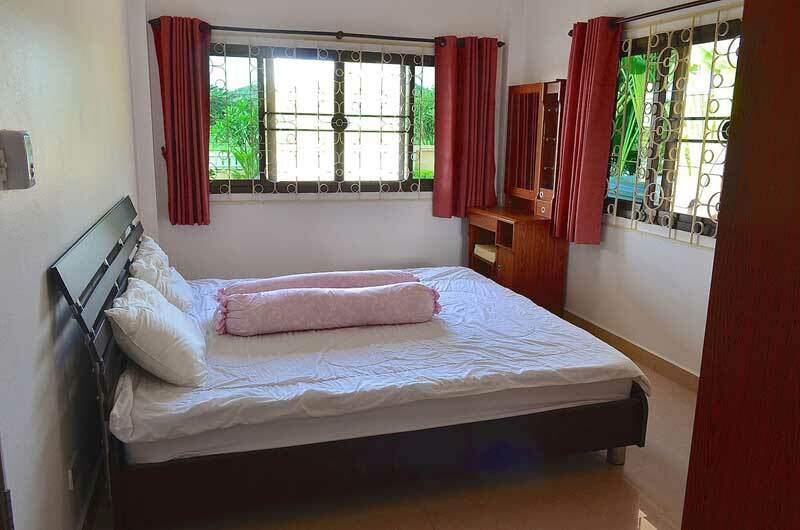 The topical pool villa for sale in Pranburi has 3 bedroom and 2 bath rooms. All rooms in the home have air conditioning and ceiling fans. All windows and doors have security screens and mosquito screens. 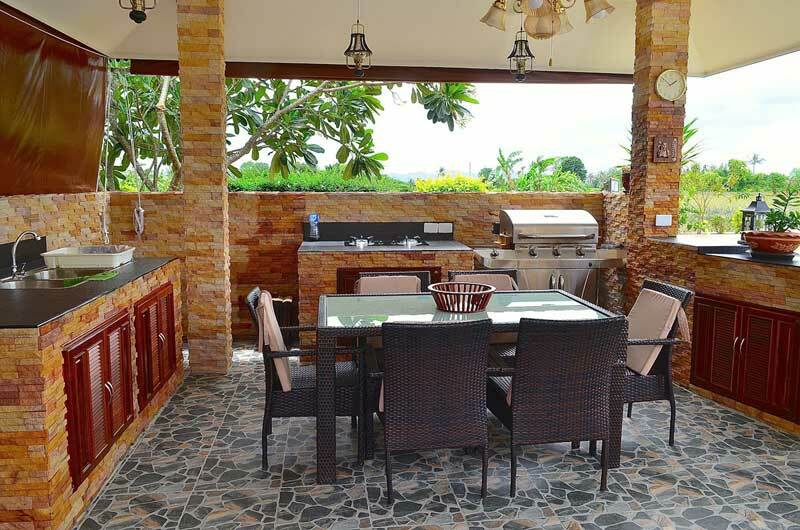 Beside the main villa there is a newly built pool sala which includes an entire outdoor kitchen (oven, refrigerator, double sink, Gas BBQ, cabinets, etc.). Pool chairs and a Thai wooden sala offer additional areas to have a beautiful day at the pool. Speaking about the pool: the saltwater pool itself has an impressive size of 5 x 15 meters (including a Jacuzzi and a children’s pool) and is one of the largest private pools in the area. The lawnmower and all the yard tools have their own place in the tool shed located at the rear of the home. Everything can be stored away neatly. 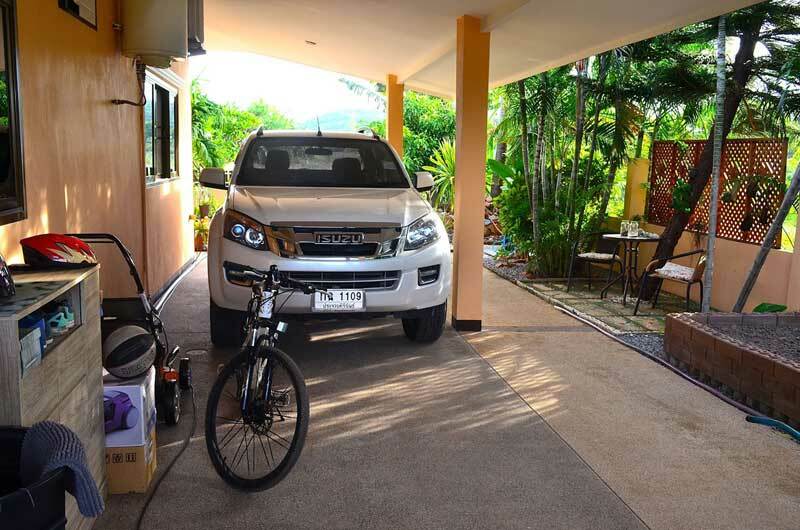 The carport offers ample parking space for up to 2 cars. There is a small 10m long custom pond with a little water fall and filled with small fish and beautiful Koi fish. Along the back on the home there is water storage for an extra 9,000 liters. The lawn has a in-ground sprinkler system for easy lawn maintenance. The pool villa has satellite tv and broadband internet. This beautiful pool villa is surrounded by the scenery of a graceful mountain range and in the midst of endless pineapple fields. 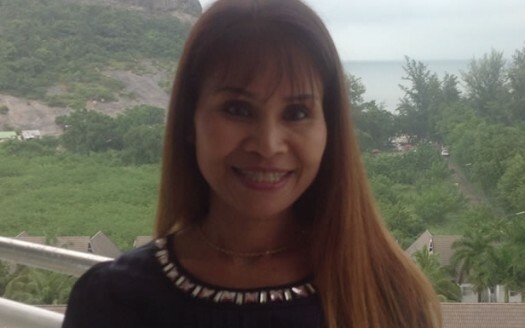 It is still located near the sandy beaches in Hua Hin, Paknampran, and Khao Tao. You are just minutes away from shopping with Tesco Lotus and Makro very close by. 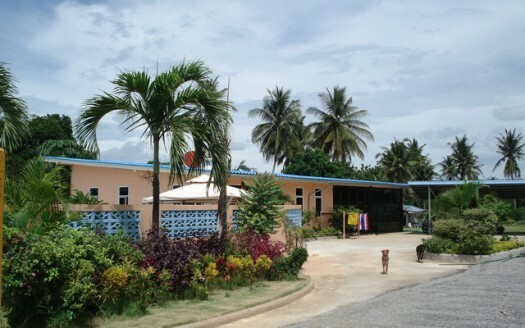 There are plenty of small restaurants nearby also along with schools and hospitals. This hidden little jewel is the chance to make your Thailand dream home come true and you can own a piece of tropical paradise. Without a question the garden is one of the “highlights” of the property. Over the past few years there were many types of palm trees, bushes, and exotic flowers planted. So you can even go into your garden and pick a fresh coconut, pomelo, papayas, mangos, pomegranates, or mulberries. Transfer fees will be split 50/50 between buyer and seller. Fully furnished: includes all inside and outside furniture, all tools, all appliances(dishwasher, microwave, refrigerators, washing machine, freezer), large stainless BBQ, plus much much more. 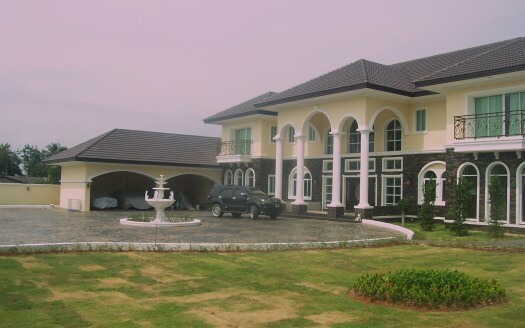 Lease: will be a good way for the foreign couples that want a own a home legally and have leased land. 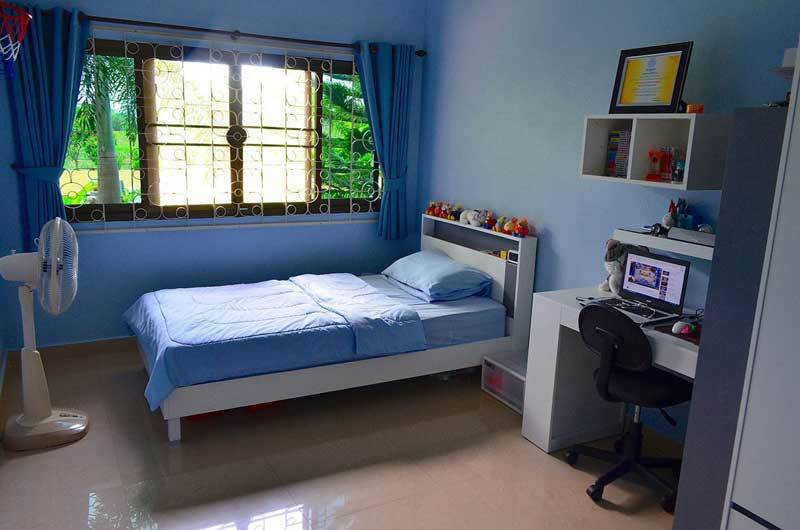 Freehold: can be a good option for Thai couples or a Thai and foreign couple. 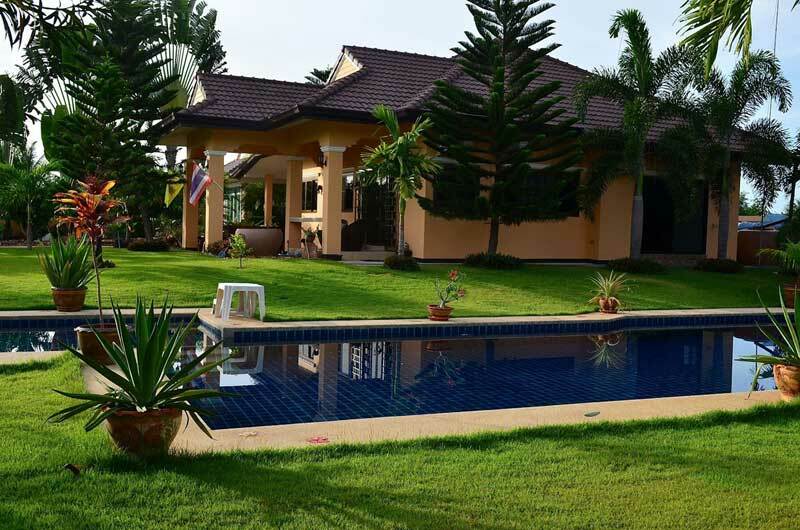 So what are you waiting for, this beautiful Tropical Pool Villa for sale in Pranburi is just waiting for you and can be your perfect retirement dream home or Thailand vacation paradise. Contact us now for a private viewing of this beautiful property.